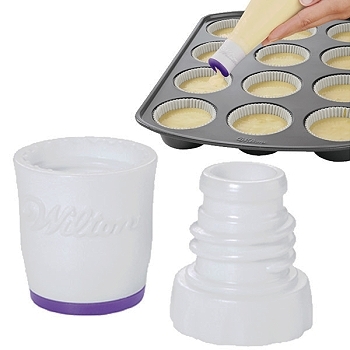 Perfect Fill Batter Dispenser, will fill baking cups and pan cavities easily with no drips or mess! 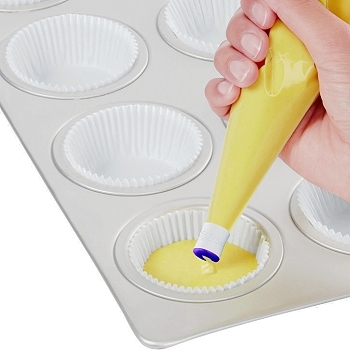 Built-in value controls batter flow for uniform filling, so you get great-looking cupcakes and cakes every time. 1) Insert tip base into the decorating bag and push into the bottom of the bag. 2) Cut the bag tip and attach the batter tip to base. 3) Fill the decorating bag, allowing for space at the top of the bag to close. 4) Squeeze decorating bag to dispense batter, and release to stop batter flow. 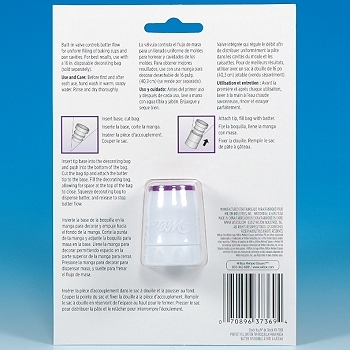 Use with a 16" or larger disposable decorating bag for best results (sold separately).